Home sinks undergo a great deal of use on a regular basis. Your kitchen sink probably captures large quantities of food debris, including oils and grease that can lead to a clog. Likewise, hairs from shaving and other obstructions can congest the sink and render it ineffective for daily use. When a sink clogs or malfunctions, you can rely on a Sears Handyman to correct the problem. Sears Handyman technicians possess strong experience in sink repairs and unclogging sinks. 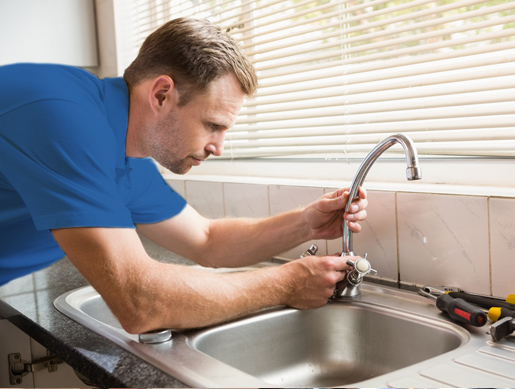 After arriving at your home, a Sears Handyman will assess the problem and determine the best solution to fix your sink so it drains properly and reliably when you need it. A new sink can dramatically affect the look and feel of a room. For the kitchen, many homeowners opt for the practicality and elegance of a stainless steel sink, which not only looks great but makes cleaning up hassle free. For bathrooms, a stylish or attractive sink can give the room a look of elegance some homeowners may have not thought possible. While a new sink can vastly improve the look and feel of a kitchen or bathroom, a new sink can be challenging for many home owners to accomplish on their own. At times, some homeowners opt for an expensive contracting service to perform sink installation, but there’s another way. Instead of going with a costly contractor, give the technicians at Sears Handyman a call. Our experienced craftsmen bring a wealth of knowledge and experience to every job, and they’ll be happy to assist in installing your chosen sink in your kitchen or bathroom. For new sinks or sink repairs, count on the professionals at Sears Handyman services to assist with your home improvement needs. 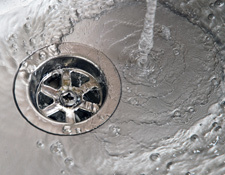 A clogged drain can make any of your plumbing fixtures inoperable. Whether you have a sink that doesn’t drain properly or a shower that holds water for too long, a Sears Handyman can assist. Sometimes drain repair needs can be solved relatively quickly by an experienced handyman. At other times, however, portions of a drain may need to be disassembled, examined, and cleared before being replaced. 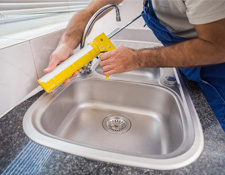 In some cases, a handyman may determine that a replacement part is necessary (like a tailpiece, reducer, or PVC trap) to ensure normal operation for your drain. Call a Sears Handyman representative today to discuss repair options.